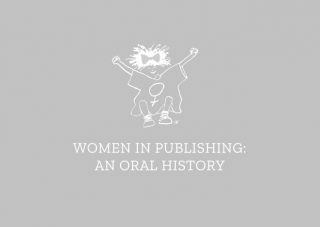 I think it was one of the quite early Women in Publishing meetings I went to when I heard somebody talking about some research they’d done about recruitment and women’s reactions to jobs being advertised. And said that this job had been advertised in the City at a very high salary and they were really keen to have women in this senior position, unusually, in this particular organisation. And they didn’t get very many applicants. So somebody suggested that they dropped the salary by £20,000 or whatever it was and advertised it again. And they did and they got a whole raft of really good women applying. So, whether that’s apocryphal or not I don’t know, but it resonated. There was that sense of, yes, we’ve spent all these years being subordinate and not being in these positions of power, we’re in danger of believing, believing that story, believing that history ourselves. I mean, one of the other things I remember hearing was an assertion that when women want to get promoted they work really, really hard at doing their job terribly, terribly well and hoping somebody will notice and reward them by promoting them. When men want to get promoted, they look at the skills that the people above them are doing and do what they can to learn those skills and to demonstrate that they’ve got them and don’t worry too much about doing the job they’re in too well – partly because if you do it very well whoever’s got you doing that job doesn’t want you to stop doing it.